T-R PHOTO BY STEPHEN KOENIGSFELD • BCLUW’s Jack Garber, center, jumps over one of the beginning hurdles during the 110-meter hurdles Friday in the Class 2A state track and field meet. Garber is seeded fifth for today’s finals, after running a 15.22 preliminary race. DES MOINES — Jack Garber doesn’t mind, too much, being compared to his old brother, Will. 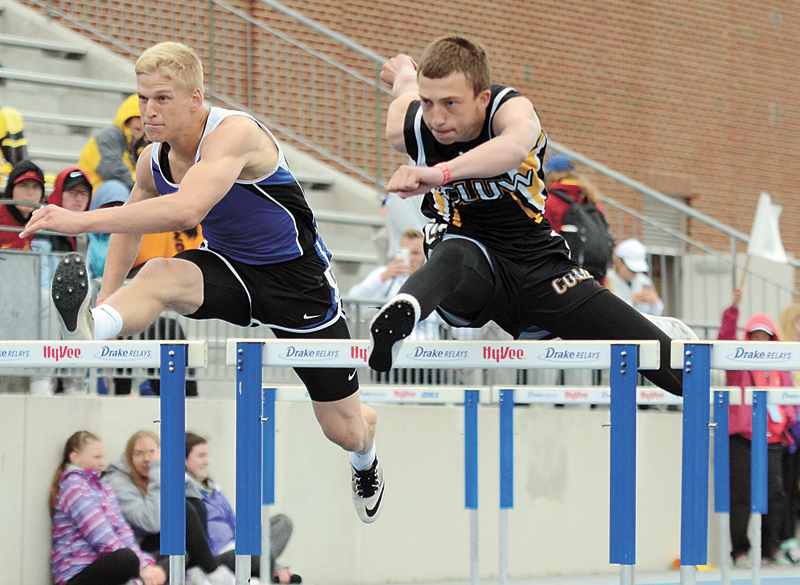 As the eldest, Will Garber won the state title his senior season in the 110-meter hurdles at the Class 1A state track and field meet in 2015, running a 14.91 to do it. Now, Jack is going to try and one-up his sibling. Jack is just a sophomore, and has a season-best time of 15.01. That was his seed time, good enough for second, in the 110 hurdles on Friday, and he qualified fifth for the finals after running a 15.22. The Comets have since moved up to the 2A level, and are seeing as fast, if not faster, competition than Will did. So how does Jack feel about constantly being pair and compared with his local legend of a brother? T-R PHOTO BY STEPHEN KOENIGSFELD • West Marshall’s Emma Meyer, left, hands off to Avril Sinning during the second exchange of the Class 2A girls’ 4x200-meter relay on Friday. The Trojans ran a time of 1 minute, 47.31 seconds to place fourth in the event. Jack will have stout competition this year, including top-seeded Michael Santi of Madrid, who ran the only sub-15-second qualifying time in 14.57. And with Riley Barrett (Aplington-Parkersburg), Will McAllister (Cascade) and Mason Timmerman (Cherokee) all seeded ahead of him in the finals today, the field won’t take it easy on the Comet sophomore. 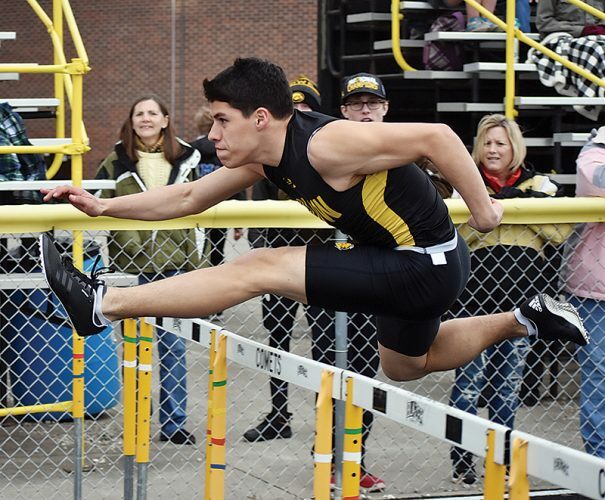 Jack is one of three underclassmen in the 110 hurdles field at the 2A level, and the only one running on Saturday. He said he hasn’t gotten too caught up in being ‘the young gun’ of the field. The field is comprised of six seniors, a junior and Jack. 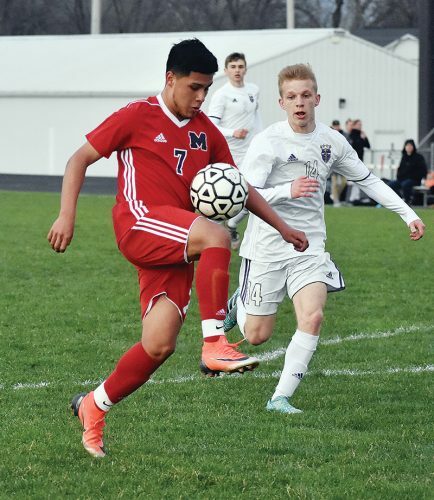 His chances of a state title his junior year skyrocket with such an elder field, but he hasn’t counted himself out yet this year. Jack will run in the finals at 1:15 p.m. immediately following the 1A race. 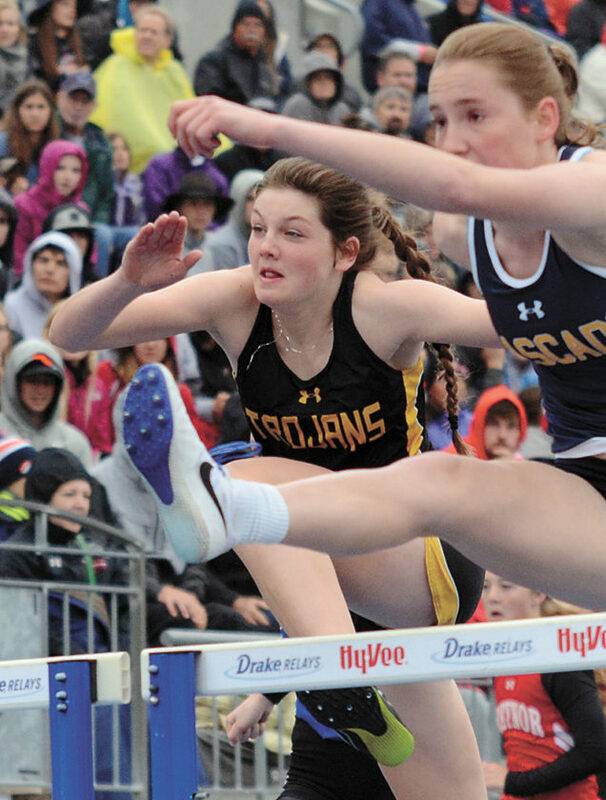 The West Marshall girls’ gave themselves a handful of opportunities for points in the team race today, with a qualifying time from Isabelle Gradwell in the 100 hurdles. The junior hurdler earned the No. 4 seed with a 15.75 in the 100 hurdles for today’s final sat 1:05 p.m. Gradwell also took 10th in the 400 hurdles, running a 1:08.25. 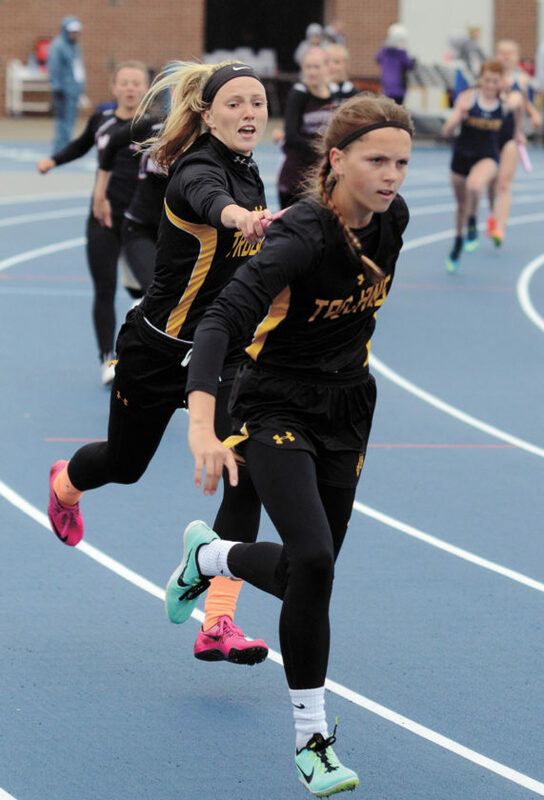 The Trojans’ 4×200 relay snagged five more team points with a fourth-place finish. The relay of Emma Meyer, Avril Sinning, Kayla Cripps and Allison Hilleman ran a 1:47.31, and grabbed a tie-breaking time of 1:47.305 to take fifth, ahead of Pella Christian’s 1:47.309. The West Marshall 4×400 relay of Meyer, Georgia Porter, Shannon Breja and Cripps was 14th with a 4:11.07 as well. It did not qualify for today’s finals. David Disney was a spot off the podium with a ninth-place finish in the high jump for the boys’ West Marshall team. Disney cleared the bar at 6 feet even to take ninth. East Marshall put through a pair of qualifying relays on Friday, with the distance medley taking the lead in 18th with a 3:46.31. That relay was comprised of Brandon Fogt, Paden Lang, Logan Nicholson and Eli Anderson. The Mustangs also had the 4×100 of Levi Needham, Zane Johnson, Lang and Fogt, place 20th in 45.46. BCLUW put through Jenna Willett in the 400 hurdles as well. She ran her time of 1:10.36 to take 19th on Friday. South Hardin’s Brylie Zeisneiss ended up double-medaling in the throwing events on Friday. 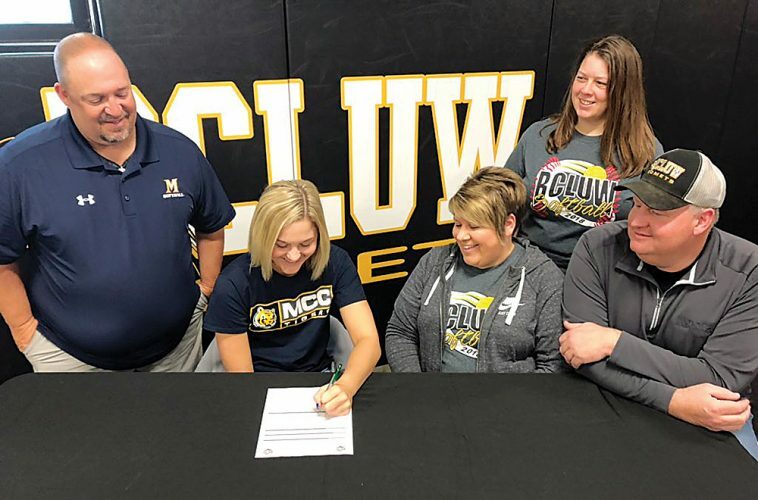 The Tiger senior was seeded just 16th with a district throw of 112-11, but managed a preliminary throw of 122-5 to earn her sixth in the discus. Zeisneiss was fourth in the shot put a day prior to the discus. GIRLS 2A — 1. Cascade 27, 2. Mid-Prairie 26, 3. Pocahontas Area 22, 4. Unity Christian 17, 5. North Fayette 16, Monticello 16, 7. Aplington-Parkersburg 14, 8. Western Christian 13.33, 9. Pella Christian 12, 10. Albia 11.33; 11. West Marshall 11; 20. South Hardin 8. BOYS 2A — 1. Kingsley-Pierson/Woodbury Central 36, 2. Madrid 27, 3. Dyersville Beckman 20, Albia 20, Kuemper Catholic 20, 6. Anamosa 19, 7. Mid-Prairie 17, Dike-New Hartford 17, 9. Treynor 16, 10. Northeast 14; 38. East Marshall 2.